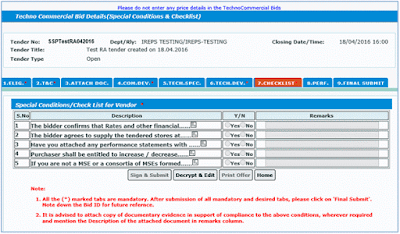 How to submit Techno-commercial Bids in Reverse Auction Tenders? Reverse auction tender can be found / searched in the similar fashion as in the case of normal e-tender. Process for payment of TDC and submission of offer are similar to normal e-tenders except financial bidding. Techno-commercial bidding process for normal e-tender. After TDC payment ypu can submit techno-commercial offer. You have to submit all mandatory tabs like Eligibility criteria, Terms and condition, Commercial deviation, Technical deviation and checklist& Special Conditions and then click on ‘Final Submit’. On successfull submission of techno-commercial bid, you will get techno-commercial bid submission Id for that tender. 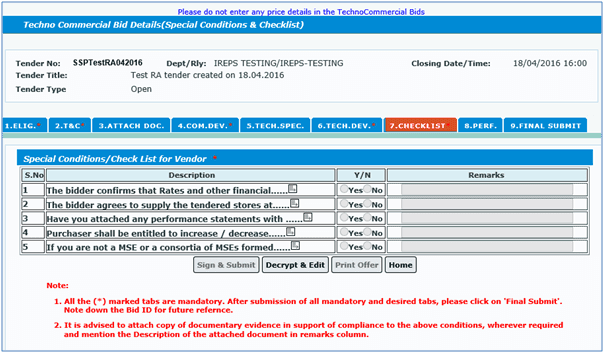 It may be noted that techno-commercial bids will not be considered complete until above page is appeared. Bidders Are advised to note this Bid ID for future reference, if required.